Well we have been working quite hard to set up our nature center and finally have quite a few native species of small wild life in glass tanks. All will be released just after Labor Day. I would like to get some nice pictures of these little critters. Besides using a polarizing filter, what are some good ways to take picture thru glass with the FZ-35. I just couldn't find any setting for photographing thru glass like some cameras have. This is a 3-1/2 - 4' Rat snake that was being pecked and attacked by birds at the entrance to the beach. The snake does eat small birds and possibly eggs so it may have been into some mischief. I just fed it a mole that the ranger's cat snagged. It has a much bigger tank now than shown here. Last edited by Chris0383; Jun 23, 2010 at 7:24 AM. Try the aeroplane scene mode, I think it might work, otherwise in P mode, angle the camera till it can find focus on the object through the glass, press the AE/AF lock button, recompose and shoot. I also believe the Landscape Scene Mode will work as well. I'm wondering if a cfp (circular polarizing filter) would eliminate the glass glare. Correction ...........a snake "signer" - they can't hear - so whispering doesn't do any good. But you are right about the glass. Take'em out of the glass - hang'em around your neck. That way you get absolutely no glare. It can eliminate reflections, which might assist the camera's AF system, but the downside is the drop in light to the sensor. If you took the tanks outside that might be mitigated somewhat. Can you clarify, is it the focusing issue that is your primary concern? as snakes are cold blooded, if they have eaten and the temperature is low enough (see Wikipedia I don''t know the specific temperature) they are extremely unlikely to take much notice of you unless you directly provoke them. I've been watching a few snake docos :-)) Are Rat snakes poisonous? Last edited by chillgreg; Jun 23, 2010 at 8:44 PM. 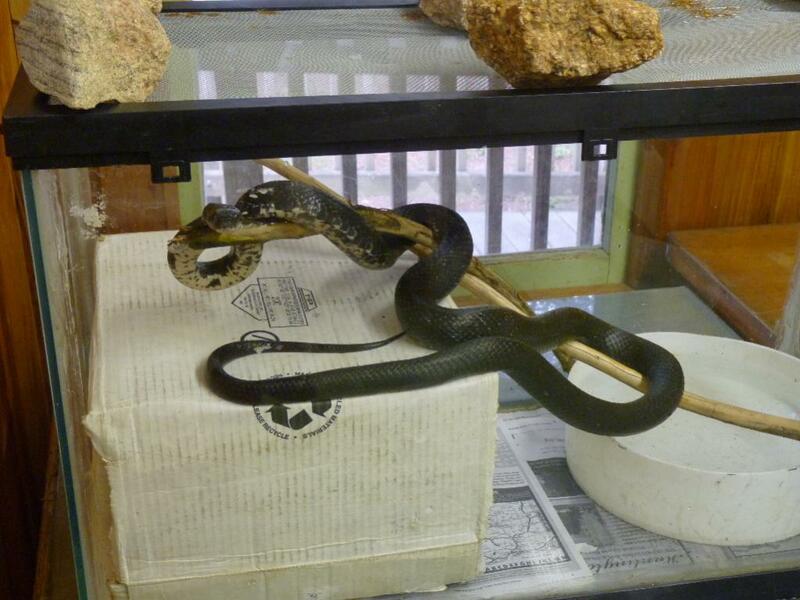 Black Rat Snakes are quite docile. It's the same kind I had around my neck. I caught 3 the other day and all 3 let me pick them up without any problem. Sometimes they will put up a bluff and strike at you a time or 2, then if that doesn't work they have a pungent fluid they will "release". But mostly they just want to get away. They are not poisonous.